Linfield are champions elect after an Andrew Waterworth goal claimed them a 1-0 win against Ballymena United at the Showgrounds. 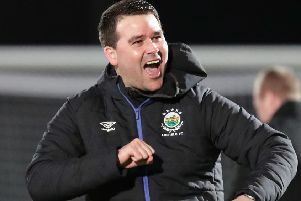 His second half strike - a minute after the break - means David Healy's men are12 points clear of their nearest rivals with four games remaining so the title is as good as theirs. For United it was another game that got away from them as dominated at times but could not find a way past the Linfield defence. Second placed United had to win this encounter if they were to make league leaders Linfield slightly nervous for the remaining four games of the season. The Blues at kick-off were nine points clear of the Sky Blues so they will know that winning three points would basically secure the Gibson Cup for the club as they would be 12 points clear of their nearest rival. The game started at a lively pace with both sides looking to get on the front foot from the whistle. United had the first chance of the game in the fifth minute as Jonathan McMurray made ground before the ball fell to Adam Lecky and under pressure he shot over the bar. Two minutes Linfield had a chance but Joel Cooper failed to connect properly at the back post and the chance was lost. The first ten minutes was played at a frightening pace as both sides were prepared to get forward when the chance arose. The big crowd were enjoying this as the top two were getting involved in a ding dong battle. In the 21st minute United had a chance as a cross found McMurray. His header being easily gathered by Linfield keeper Gareth Deane. McMurray went close again in the 23rd minute as his header went just wide of the Blues post. The Sky Blues should have gone ahead in the 25th minute. A corner fell to Koki Balmer and his effort hit the crossbar before the ball fell to Jude Winchester. His effort being blocked by the desperate Blues defence but United were having a good spell. Andy McGrory then went close in the 34th minute for United as his free-kick was clawed away by keeper Deane as it headed towards the top corner. A good save from Blues stopper. Jimmy Callacher then got a header on target in the 35th minute but United keeper Ross Glendinning was equal to the challenge. Four minutes from the break the Blues nearly as keeper Glendinning pushed away a header with the help of a post but Linfield meant business as the opening 45 minutes was coming to a close. It was 1-0 to Linfield a minute after the break. Joel Cooper got past Balmer before bursting forward. His pass found Andrew Waterworth and he finished past Glendinning to give the league leaders the advantage. It was Waterworth's first involvement in the game and what an important one. That goal seemed to knock a bit of the stuffing out of United while the Blues were starting to move the ball at pace as their confidence grew. United then had a chance in the 55th minute as Lecky fed McGrory but his effort went straight at Deane in the Linfield goal. A chance missed but United were very much still in this with 35 minutes left on the clock. Linfield may not be the most attractive side to watch but they certainly know how to defend as United were finding out. McMurray then tried his luck from a free-kick in the 66th minute which went straight at Deane in the Linfield goal. United had a couple of corners in the 70th minute but Linfield were defending well as they repelled the United attacks. McMurray had another chance in the 75th minute but his shot lacked power and Deane gathered and the chance was lost. Callacher then missed a free header in the 78th minute from a corner as the Blues looked for their second of the night. 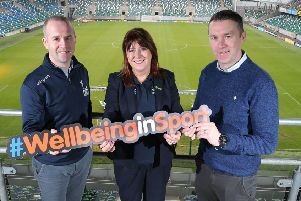 Ballymena United: Glendinning, Addis, Whiteside (Mayse 80 mins), McCullough, McGrory, Balmer, Winchester ( Kane 63mins), Ervin, Lecky, Millar, McMurray. Subs not used: Williamson, Quigley, McGinty, Shevlin, Watson. Linfield: Deane, Robinson, Callacher, Waterworth, Cooper (Millar 78mins), Stewart (Clarke 83mins), Kearns (Fallon 90mins), Mulgrew, Mitchell, Quinn, Casement. Subs not used: C Mitchell, Stafford, McGivern, Cervenka.